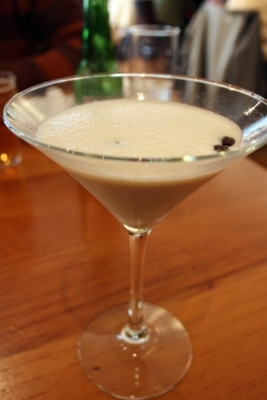 The Qahweh is a coffee cocktail made with espresso, Stoli Vanil, Bailey’s Irish cream, simple syrup, and a thimbleful of espresso beans. It is served frothy with a few ice chips in the mix, which I always enjoy. The Irish cream is by far the strongest taste, and that’s never a bad thing. Some vanilla also reaches my tongue, but the espresso’s presence should definitely be turned up a few notches. It’s pretty tasty, but there’s nothing out of the ordinary here. @thegourmez Looking forward to your thoughts on Sitti. It is on my list to try but haven’t yet managed to get there! @TheMasalaWala It was super good. You must try it!